John Berggruen Gallery is pleased to present an exhibition of recent works by Joel Shapiro. This exhibition opens Thursday, April 5th, and will remain on view through Saturday, May 12th. An opening reception for the artist will be held on Thursday, April 5th, from 5:30 to 7:30 p.m. to coordinate with the San Francisco Art Dealer’s Association’s First Thursdays. Joel Shapiro began working in the late 1960s at a time when traditional notions of sculpture were being radically redefined by Minimalism and Conceptual Art. In this exhibition, Shapiro will continue his investigation of the connection between line and form. 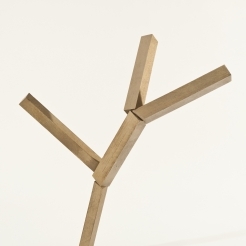 As Shapiro himself explains, “Vitality of form is still something that I pursue.” Featured in this show will be bronze and painted wood sculpture, including a recently completed nine-foot tall bronze, as well as works on paper. Constructed with an exacting eye for detail, these beautifully fabricated sculptures are a pleasure to examine up close. Shapiro’s work has been the subject of over one hundred solo shows and retrospectives. Most recently, the artist completed a commission of a 32-foot-tall aluminum work for the newly opened Clyfford Still Museum in Denver, Colorado. His other public commissions can be seen at such sites as Creative Artists Agency, Los Angeles; The United States Holocaust Museum, Washington, D.C.; Köln Sculpture Park, Cologne, Germany; National Gallery of Art Sculpture Garden, Washington, D.C.; and the International Sculpture Collection, Rotterdam. Shapiro’s work is included in numerous public collections such as The British Museum, London; The Corcoran Gallery of Art, Washington, D.C.; The Solomon R. Guggenheim Museum, NY; Metropolitan Museum of Art, NY; Moderna Museet, Stockholm; Musee national d'art moderne, Centre Georges Pompidou, Paris; Museum of Fine Arts, Boston; Museum of Modern Art, Friuli, Italy; The Museum of Modern Art, New York; The National Gallery of Art, Washington D.C.; The Tate Gallery, London; and The Whitney Museum of American Art, NY. He lives and works in New York City. All images reproduced here © 2012 Joel Shapiro / Artists Rights Society (ARS), New York.